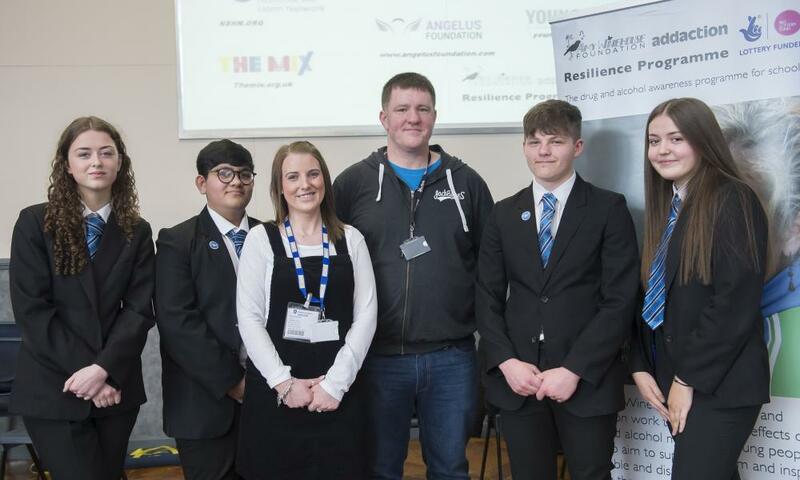 Recovering drug addict Brian Burns from The Amy Winehouse Foundation and Amy Fitzpatrick from Addaction talk to Tollbar Academy Year 10 students (l-r) Emmie Thomsen, Iqtiday Khan, Sam Woolford and Gaby Prados. A man who lost 23 years of his life to drug addiction is using his experiences to help vulnerable young people in schools throughout the region. Brian Burns, who now lives in Lincolnshire, works for The Amy Winehouse Foundation. 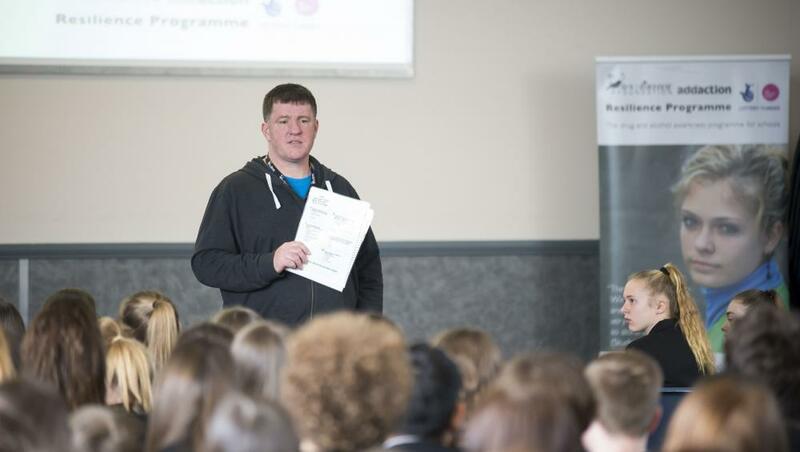 He visited Tollbar Academy to talk to students in Years 8, 9 and 10 as part of the Addaction Resilience Programme. The two organisations are working to prevent the effects of drug and alcohol misuse on young people. They also aim to support, inform and inspire vulnerable and disadvantaged young people to help them reach their full potential. Students at the Academy were shocked to hear Brian's life story. In recovery for the past 10 years, he told them how he lost his friends, his family and his home through drug addiction, which began with smoking cannabis at the age of 13 to fit in with others. His addictions spiralled and he eventually spent 12 years as a heroin addict and a further year as a heroin and crack cocaine addict, becoming homeless for several months. Brian was only saved from death by a charity-funded rehabilitation programme, which funded his 18 months of residential treatment. He then spent a further year volunteering at the rehab centre. "I would be dead by now if it wasn't for them," he explained. "They came along at the right time in my life. While I was in rehab we worked out how much money I had spent on my drug addiction. I stopped counting at £195,000 because I was so disgusted with myself. "I am now married with three children and, at the age of 47, I have a proper job and a real life. But this is the life I should have had when I was younger. I lost 23 years to my addiction and that is the message I want to get over to the young people. "I am not here to tell them not to take drugs. But I am here to advise them not to because I don't want them to wake up 23 years from now and realise that their lives are in this mess. I know how this ends up." The Amy Winehouse Foundation is a registered charity set up in memory of English singer-songwriter Amy Winehouse by her family after her death in 2011 from alcohol poisoning. She was just 27. Working for them, Brian has been sharing his experiences in schools for the last five years. He said: "Although I am talking about my drug addiction, The Resilience Programme is not just about addiction. I talk about self-esteem and risky behaviour and we give young people coping strategies to help them deal with peer pressure, bullying, self-harming, family splits and many other difficulties they may encounter. "The feedback has been very positive over the years. It gets young people to think about their actions and some of the consequences that might result from them. We try to help them to make informed decisions about their life choices." Year 10 student Sam Woolford said: "This is someone who knows what they are on about - drugs and living the life no-one wants to live." Gaby Prados said: "It shows that it is more common than we actually think. He didn't tell us not to do drugs but showed the negative effects it has had on him. He was homeless at one point and no-one really wants that." Iqtiday Khan said: "Brian's personal story and what he went through was very informative." Emmie Thomsen said: "Brian made drug addiction seem a lot more realistic than what you see on the TV and the media. You think you could control drug addition but it will grow. You think you will just do it once but then you would do it again. Like he said, you might think your drug dealer is your best mate but once you owe him money he won't be your best mate any more." Amy Fitzpatrick from Addaction said young people are always intrigued to know about someone else's life story. "A personal story is much more inspirational in getting the message home," she said. Brian Burns takes questions from students at Tollbar Academy on behalf of Addaction and The Amy Winehouse Foundation.